See New York City sparkle on an evening panoramic tour of the city lights. 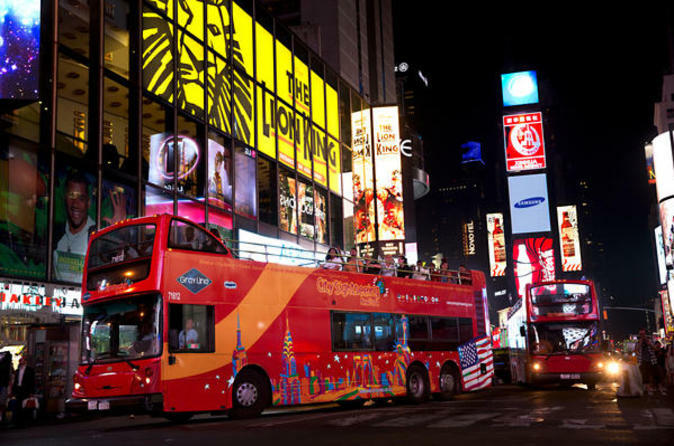 See the Empire State Building, Times Square, Greenwich Village, SoHo, Chinatown, the Lower East Side, Rockefeller Center and more aboard a double-decker bus for unbeatable views of the glittering Manhattan skyline. This is the perfect way to rest your feet after a full day of sightseeing and start your night out on the town. Climb aboard a double-decker bus on the West Side of Manhattan in the evening for an amazing 1.5-hour tour of New York City by night. Enjoy interesting and informative commentary from your onboard guide while touring New York's must-see neighborhoods. Feel the wind in your hair and soak up unobstructed views of glittering Times Square, Chinatown, Greenwich Village, Rockefeller Center, SoHo, Little Italy, the Manhattan Bridge and the Lower East Side. Snap photos of the Empire State Building lit up against the night sky, and cross over the Brooklyn Bridge to the borough of Brooklyn for jaw-dropping view of the entire New York City skyline in all of its dazzling glory. During the holiday season, the Night Tour is replaced with the Holiday Lights Tour, which focuses on Midtown to show you New York City’s legendary department store windows and other Christmas-themed decorations. Upgrade to the 48-hour or 72-hour All Loops Tour that includes the Night Tour plus all 3 Loops, Hop-on Hop-off Cruise, entrance to Museum of The City of New York or New York Historical Museum and a discount card! Special Offer - Book and save 40% compared to the local supplier's price - Book Now!